(AKRON, OHIO – March 31, 2017) – The GPD Group Employees’ Foundation recently approved grants to 133 organizations in Northeast and Central Ohio, Atlanta, Dallas, Indianapolis, Louisville, Phoenix, and Seattle. The recipients were selected from over 180 applications received during the grant cycle ending January 13, 2017. Nearly $515,000 of grant awards will be disbursed this year by the foundation, whose mission is to make a difference in the lives of children. Early education services supporting Early Head Start and preschool for low-income children’s school success. Educational support for children who are developmentally delayed due to domestic violence. Homeless youth outdoor movement and art therapy storage shed. Advanced Placement environmental science class trip to Sweetwater Creek State Park. New May and September outreach events. Home Based Services to improve parents’ medical compliance preventing children with medical complexities from entering foster care. Scott Rams Mentoring Program to provide academic support, positive adult interaction and community exposure to 3-5 grade students. Music therapy in the Pediatric ICUs. Reaching out to provide children with cystic fibrosis in the state of Georgia emergency, nutritional, insurance, medication, and medical supply assistance. Camper Scholarship Program to send an entire cabin of 10 children with a serious illness, disability or life challenge to a week-long therapeutic summer camp at Camp Twin Lakes in summer 2017. Preschool Digital Assessment Program to incorporate a digital assessment tool to track progress and preparedness for over 270 preschool students. disABILITY Awareness Program to increase the capacity of disability awareness. Get Fit to help students learn to live a healthier life. To replace books that have been “loved,” as well as add more books that are currently “loved” by sixth grade students, and will be “loved” in the future. Robotics Club to give elementary students experience in working on STEM projects. Early Childhood Education Program for Children with Down Syndrome to help children, birth to 5 years, with Down syndrome to achieve developmental milestones. Automotive equipment for their new vocational training facility that teaches car repair and life skills to teenage youth in Indianapolis. Riley Hospital for Children at Indiana University Health School Program to enable hospitalized children to continue their education while removed from their traditional school environment. Kaleidoscope Swimming to enable medically fragile students to go swimming as a part of their school day to improve their range of motion, confidence and independence. Unified Champion Schools to build a culture of inclusion by bringing together youth with and without intellectual disabilities through sports, education and awareness activities. BGH Campus School / STEM Initiative to expose students to critical STEM skills / concepts that will potentially ignite further successful learning and stimulate interest in STEM related careers. Speak Out! to provide services to ensure all children are ready for kindergarten. Flexible seating for Mrs. Hayes’ Third Grade class to allow diverse learners the ability to engage in more active learning experiences. Updated language materials for students that have a variety of speech / language deficits. American Studies: an interdisciplinary course that teaches high school freshmen the connection between American History and American Literature. Technology to support student needs by providing access to an iPad for the use of Snaptype to complete assignments. STEM-Based Interactive Learning Project to enhance academics / creative thinking with a multisensory technology system that uses an iPad and Osmo to bridge real and digital realms in the classroom. Create an individual identity portfolio of their writing from the year that will be professionally printed. Life Town to provide a realistic indoor city for special needs students to practice life skills via role play. iPad and Osmo educational game system to foster learning in key focus areas in special education including problem solving, counting, addition, spatial relations, phonics, and nonverbal communication. Community Outing Project to take special education students on community outings to work on social, money and behavioral skills as well as introduce them to different career choices. Flexible furniture in elementary classrooms to enhance learning. Intermediate STEM LittleBits for Learning to provide materials for fifth and sixth graders to experience hands-on and interactive engineering opportunities. Field Trip to Young’s Dairy to provide a reward for 6th grade students with no disciplinary action against them during the 4th quarter. A, B, C’s On Track Incentive Project to help struggling, at-risk students stay in school. Terrific Teaching Technology Project to enhance the academic instruction of cognitively delayed students. Blendon Bulldog Buddies to foster relationships through games and activities. Osmo to foster learning in key areas such as creative problem solving, art, STEM, and common core. Freedom Is Not “Free” to provide students resources and opportunities to be involved in a school-wide Veterans Day celebration. High Tech: Building Skills through CAD and 3D Printing to enhance students’ engineering and basic problem-solving skills. Second Graders in History-Take 3 to allow children to see history come to life on a field trip to Hale Farm and Village. Read to Succeed Using QR Codes to expand students’ reading comprehension, listening skills, fluency, and love of reading using the latest technology to engage young minds. Free In-School Concert Series to enrich the music education of children by providing live musical concert experiences in the informal setting of their school. Provide translation, educational and cultural support to the strong Guatemalan community in Tuscarawas County. Summer Enrichment Day Camp to provide scholarships to urban youth, ages 5-12, to participate. Distance Learning Music & Interdisciplinary Education Classes to provide interactive video conferences and the technical license needed to connect to under-served public schools. Fund a Smile at Akron Children’s Hospital: Provide one-on-one makeover and dress-up experiences for children at ACH with a goal of creating smiles and improving self-esteem. Early Childhood Intervention and Toddler Classroom Programs to help change the life trajectory for children with special needs with evidence-based early childhood interventions. Funds for Emergency Shoes and Clothes for Children to provide children’s clothing and shoes for the weather or school uniforms. Shamrock Games 2017 to welcome approximately 400 Special Olympics athletes from surrounding Ohio organizations to compete in track and field and tennis events. Cover 20 field trip transportation costs for the Southpark and Prairie Norton sites serving immigrant and refugee elementary age students from July 2017-May 2018. Youth Wellness and Cancer Prevention Program to expand the wellness program for youth obesity prevention and cancer prevention in the schools. AfterSchool All-Star’s Program to provide transportation for students to participate in their youth development life skills program. Create a STEAM / Makerspace Media Center as a transitional space that corporates books, technology and activities that allow students to think, make and improve STEAM projects. Provide a tool for students with multiple disabilities and on the autism spectrum to use to exercise their voice and interact with the community. Mini-Makers: Cultivating a Culture of Innovation to provide elementary-aged students the opportunity to explore STEM fields through the use of materials in the school’s makerspace. Woodridge Destination Imagination to compliment the K-12 educational experience by fostering courage, curiosity and creativity in solving open ended problems. Lego Education: Story Starter to bring writing to life and engage our students in a hands-on way. Create a sensory room that will provide students the necessary support for their emotional, social and educational success. The Five Senses in Education to incorporate all the senses for complete and long-lasting learning. Use self-organizing learning education research method in the classroom to allow students to use their research, presentation and critical thinking skills to drive the learning process. Project Petie to support an in-hospital visitation program featuring Petie, a miniature pony, who visits seriously ill or injured children at Akron Children’s Hospital. Adolescent Suicide Prevention Program to provide educational presentations to middle and high school students throughout Summit County regarding depression and suicide. Milton Rubin Oral Health Education Program to teach children how to effectively brush their teeth and develop favorable attitudes toward oral health through awareness, education and demonstration. Reach Out and Dance to embed professional dance instructors for a year-long program of in-school sessions at local elementary and middle school special education classrooms at Akron Public Schools. Provide special needs students in Mrs. Moses’ classroom with technology in order to help them access the general education curriculum more successfully. Functional Daily Living Skills to provide students with the materials and experiences to become more independent community members,. KNFB Reader – Text to Speech App to provide a high quality app for students with disabilities. Kelly’s Grief Center / In School Counseling Program to provide grief counseling to groups of students that are dealing with the loss of a loved one. Annual Sensory Performance to provide a sensory-friendly performance for young audience members on the autism spectrum and those with other sensitivities. Fabulous Fitness Program to include 6 more special ed. classrooms for the 2017-18 school year. Personalize, Engage, Grow: Creating an Innovative Library to create a space in which students will have the opportunity to work individually and collaboratively to perform and create. Giving teachers a space to bring students to experiment, observe, perform, and to bring nature into the classroom by bringing the classroom into nature. Provide charging stations and carts for classroom mobile wireless devices for grades K-3. Indian Trail – Green Schoolyard – Stage 1 to provide outdoor education and environmental studies to create engaged, lifelong learners with the skills and confidence to influence the world around them. The Learning Program, a literacy program for grades K-3 to complement formal public school instruction in literacy, with occupation and speech therapy components. Financial assistance program for students enrolled in the Take Flight therapeutic equestrian program. Writing Center video project to allow students to create videos while teaching writing skills. Brodie’s Challenge to provide a Merlin LCD in support of a student with cerebral issues. Learning in Motion to furnish sit / stand student desks for general education classrooms. Mental Health Services Outreach to provide treatment, community advocacy and resource linkage for at-risk and homeless teens and families. Inspiring Tomorrow’s Leaders to provide experiential education on financial literacy, work readiness and entrepreneurship to students at Akon Public Schools’ NIHF STEM Middle School. Summer Reading Counts to extend the school year for at-risk primary students and engages families with training and resources to support their child’s literacy development. Playground Improvement Fund to provide children with disabilities a safe environment for outdoor play. Donovan’s Kids Camp to provide programs for children who are amputees or have limb differences. Therapy room redesign to create a therapeutic and child-friendly environment for foster children and behavioral health clients. NICU Lending Library to provide literacy opportunities for patients and families to promote reading, family involvement, early intervention, and sibling engagement to medically fragile children. Great Balls of Fun to provide a ball pit and crush resistant balls for sensory integration for students with moderate to intensive special needs. Youth Technology Academy to ignite the interest of high school students in STEM studies and career pursuits via robotics training, competitions and college credit in technology courses. A School to Work Program for Youth with Disabilities to improve academic achievement and career prospects in high school, leading to competitive employment upon graduation. Intensive Services Therapeutic Materials to enhance treatment plans for youth who require intensive services for issues like sexual behavior problems, violence or substance abuse. Summer Arts Day Camp to support a 6-week program for 225 at-risk children in Cleveland, offering music, dance, theater, visual arts, reading, writing, and math. Educational Enrichment Component to provide after-school and summer programs for K-12 students. Toy Adapting Workshops to host 4 workshops promoting STEM education for Northeast Ohio public high school students, helping students with and without disabilities. Reach Out and Read Program to distribute new, developmentally-appropriate books to children served by their network of primary care offices. Adaptive Sports for Youth with Disabilities to support weekly adaptive sports sessions and their annual Dream Camp. Early Intervention Services for Children Who Are Blind or Have Low Vision to support children aged 0-3 who are blind or have multiple disabilities, providing parent education throughout the process. Literacy for All Project to provide new books for elementary-aged children living in poverty. Toy Adaptation Program to adapt toys so children with special needs are able to use them at no cost. University Hospitals Rainbow Babies & Children’s Hospital Sibshop Program to offer siblings of children with special needs opportunities to have fun, express their feelings and create friendships. Summit County CLASS Scholars Pilot to improve the quality of early childhood instruction and Kindergarten readiness in Summit County. Summer Drama Camps & Special Need Camps to offer two of each camp in 2017. Provide four books each to 7,254 children in Cleveland’s 20 lowest performing elementary schools to foster literacy, a love of reading and academic and lifetime success. Secure updated curriculum, activity sheets, accompanying parent guides, program supplies, and train staff / volunteers in delivering the learning goals. Hunger Hero Assisted Student Volunteer Program to support high school students with special needs to volunteer at the Foodbank to help improve the lives of those in our community facing hunger. Full STEAM Ahead: Space for Lakeview High School Makers to provide shared resources, beyond the normal classroom budget, to students and staff to support STEAM education. Summer Treatment Program: Financial Need Scholarships to provide evidence-based behavioral treatment in a day-camp setting to empower children with ADHD and their families to improve behavioral, social and academic functioning. Orthodontic Care Program to put orthodontic braces on children’s teeth with severe orthodontic problems, growing up in a poor or working poor family situation. MDA Summer Camp to provide a week-long, overnight camp that is 100% adapted to give kids with Muscular Dystrophy a true summer camp experience. Let’s Build a Person to allow anatomy and physiology students to use clay on a skeletal structure to build a person, including muscles, tendons and veins. Changing Futures through the Game of Golf 2017 to support the expansion of the education, golf-based youth development programming to Akron Public Schools’ students. Hear, Talk, Learn Expanded to continue maximizing auditory access for children with hearing loss in the Summit County region through hearing technology and specialized professional learning. Safety Town and Safety Town PLUS programs to provide hands-on safety education for school children of all abilities. 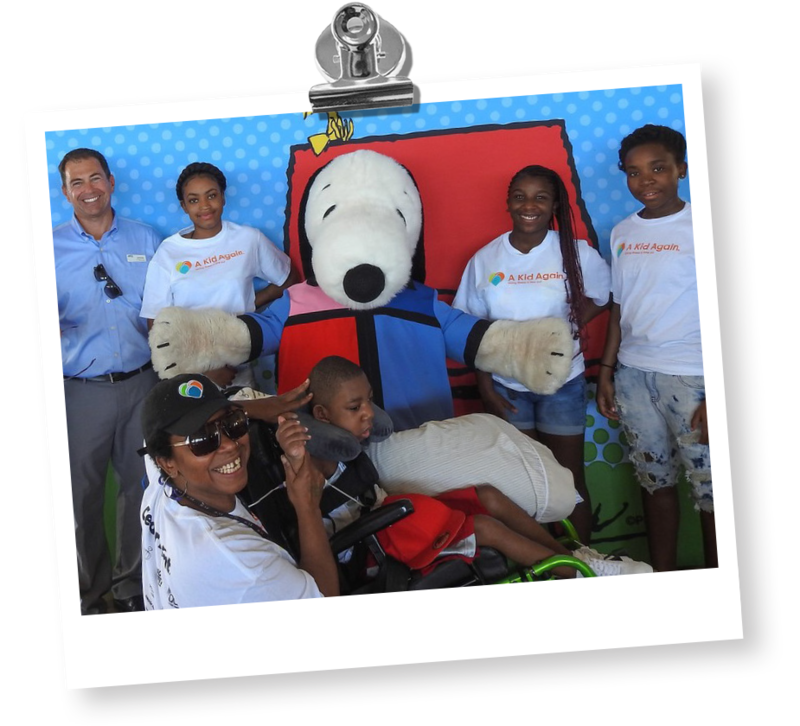 Programs of A Kid Again-Adventures to provide cost-free, fun-filled, year round group adventures that allow critically ill children, their siblings and parents to put illness aside and be a “normal” family. Camp Invention 2017 to support STEM-based enrichment serving underserved Akron and Grandview, Ohio youth. Academic Success & Healthy Lifestyles Programs to provide after school programming for Akron youth grades K-6. Innovation Center to bring opportunities to Lordstown students that involve the click and the brick. Family Weekend September – Cancer Awareness Month to host children with cancer and their families at Kalahari. iCan Bike Program to host the 6th iCan Bike Camp for individuals with disabilities to learn to ride a conventional two-wheel bicycle independently. Growing beyond the classroom to provide all students the ability to participate in hands-on learning in a variety of ways within a greenhouse. APS Robotics Begins! to expand the STEM robotics concepts and programs in the district. 2017 Inclusion Day to provide Summit County youth who have various special needs the opportunity to race down the infamous Derby Downs Track in a dual controlled Soap Box Derby car. Support for infants and children in the Wellness Nursery whose safety is jeopardized by medical conditions that cannot be supported due to family crisis or unstable living conditions. STEM / Robotics Program to provide elementary, middle and high school students access to the STEM technology required to succeed in current and future careers. SHS Makes! Strongsville High School MakerSpace: Project-Based Learning Labs to provide innovative spaces centered around STEM / STEAM equipment. Mini Maker Fab Lab to build a Fab Lab at the museum to encourage children to make, take apart, re-create, and fabricate to foster curiosity and learn 21st century skills. Social Emotional Learning (SEL) Initiative to teach SEL skills to promote a learning environment where kids are self-aware, empathetic and can make responsible decisions. Special Education Program to allow the special education students on campus to access and utilize 21st technology and better help teachers be more efficient and confidential. Community Collections and Distribution Program to help vulnerable families properly care for their children by providing them with free children’s clothing and diapers, and safe cribs and car seats. Superhero Capes / Masks for Homeless and Medically Ill Children to make 15,000+ capes / masks for children nationwide. GPD Group (GPD) is an employee-owned, full-service architecture and engineering firm with over 540 design professionals. Headquartered in Akron, Ohio, GPD has satellite offices in Chardon, Cleveland, Columbus, Marion, and Youngstown, Ohio, and Atlanta, Dallas, Indianapolis, Louisville, Phoenix and Seattle. GPD employees established the GPD Group Employees’ Foundation Inc., a 501(c)(3), in 2014 to help channel donations to enrich the K-12 public education experience and support children with medical and special needs in communities where the firm works. For more information about the GPD Group Employees’ Foundation, visit them online at www.gpdfoundation.org or call toll free at 1-800-955-4730.